Chinese dairy import in January, after a month of December marked by growing imports, continued the positive trend. The monthly balance shows an increase of 17.3% in the quantities imported and a +20% in value compared to January 2018. On the other hand, the monthly price of imported products, converted into Milk Equivalent (ME), decreased to 35.88 $ / 100 kg. To find a lower value, you need to move back to January 2017. Step forward for WMP and SMP, supported by lower prices. 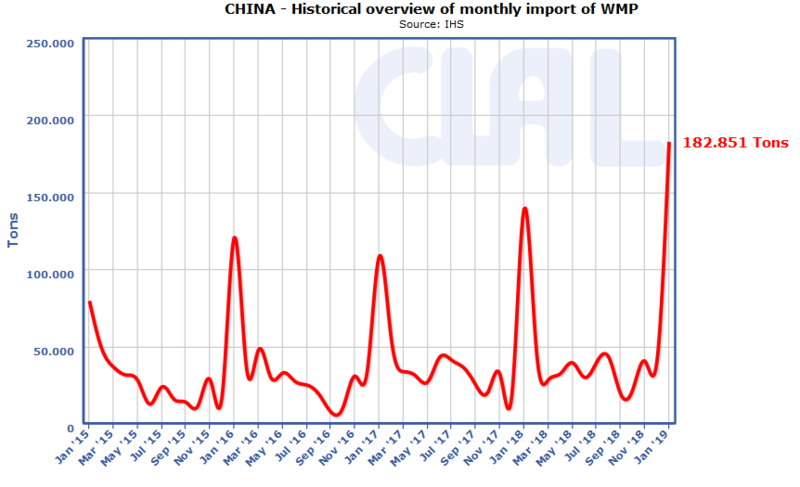 In particular, WMP represents the most important product of Chinese imports with almost 183,000 tons imported in January (+31.4% y-o-y), for a value that exceeds $ 555 million (+19.3%). New Zealand, with 98% of the market share, is an undisputed monopolist. January imports were probably favored by the “tariff window”, as in previous years. Sustained growth also for Skimmed Milk Powder (SMP): +25.4% in quantity and +23.4% in value, with Oceania covering a market share of 80%, followed by the European Union that in January exported +111.2%. EU-28 is the first supplier of infant milk formula, +34.7% compared to January 2018. 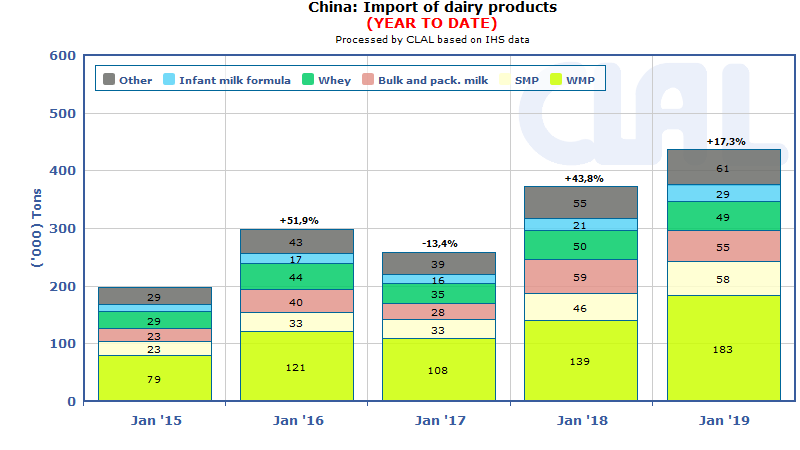 Overall, Chinese imports of “infant milk formula” increased by 40.6% in quantity and 47.4% in value. The Cream performance was also good (+121.5% in quantity and +96.7% in value), supported by unit prices decreased by 11.2%. A negative sign, however, was recorded for Butter (-14.7% in quantity and -28.6% in value) and for Cheese (-1.5% in quantity and -5.7% in value). The trade war with China is not good for the United States, in fact China has excluded the U.S. from the list of dairy exporters. All the indicators that matter are negative.